Some species of Central American swollen-thorn acacias lack the chemical defenses of most other acacias to deal with their predators and competition. Without bitter alkaloids, ravaging insects and browsing mammals eat the leaves and branches, slowing the growth of the acacias and allowing fast-growing, competing vegetation to shade them out. Symbiotic ants have taken over this vital defense role, protecting the acacia from hungry herbivores and pruning away competing plants. The ants live inside inflated thorns at the base of leaves. The bullhorn acacia (Acacia cornigera), a swollen-thorn acacia native to Mexico and Central America. In its native habitat, colonies of stinging ants (Pseudomyrmex ferruginea) occupy the hollowed-out thorns and fiercely defend the tree against ravaging insects, browsing mammals and epiphytic vines. In return, the host supplies its little guardian ants with protein-lipid Beltian bodies from its leaflet tips (yellowish granules in photo) and carbohydrate-rich nectar from glands on its leaf stalk (volcano-shaped structure just above pair of thorns). There is no known function for the Beltian bodies, except to provide food for the symbiotic ants. The bullhorn acacia (Acacia cornigera) photographed in San Diego County. 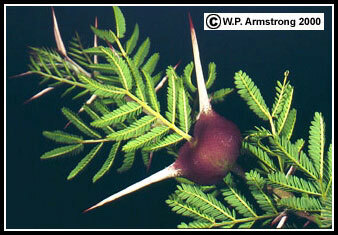 The thorns and Beltian bodies at leaflet tips develop even though there are no native ants to protect the tree. An acacia ant (Pseudomyrmex ferruginea) sipping nectar from the petiolar nectary of a swollen thorn acacia (Acacia collinsii) in Costa Rica. These ants fiercely defend the tree against browsing mammals and epiphytic vines in one of nature's most amazing symbiotic relationships between a tree and an insect. Acacia macrantha, a Central American thorn acacia with large, "unswollen" stipular spines and bright yellow flower clusters. Unlike the Central American swollen-thorn acacias that are protected by symbiotic ants, this species produces alkaloids to discourage hungry herbivores; therefore, it doesn't depend on stinging ants to defend itself. Because it produces alkaloids it also grows more slowly than the ant-protected acacias, and must grow in drier habitats where the competing vegetation also grows more slowly. The whistling thorn of Kenya (Acacia drepanolobium) has bulbous thorns occupied by stinging ants of the genus Crematogaster. Like the Central American acacias, the ants hollow out the soft green thorns for living quarters. Giraffes and other herbivores normally eat thorny acacia foliage, but leave the whistling thorn alone. In fact, for most South African acacias, spines alone are no deterrent to giraffes. They simply reach high into the branches and carefully wrap their long prehensile tongue around the tender foliage, carefully avoiding the vicious spines. At the San Diego Zoo you can watch a giraffe delicately removing tender leaves from the winter thorn (A. albida) near the edge of its enclosure on Horn and Hoof Mesa. Their feeding actually produces the characteristic flat-topped shapes of many acacias on the vast African savannahs. In the case of the whistling thorn acacia, a mouthful of stinging ants is an excellent deterrent to hungry herbivores. Old thorns which have been vacated by the ants make a whistling sound as wind blows across the entrance hole. Large, inflated thorns of the whistling-thorn acacia (Acacia drepanolobium), an African swollen-thorn acacia. In the wild, the thorns are occupied by symbiotic stinging ants of the genus Crematogaster that protect the tree from destructive herbivores. 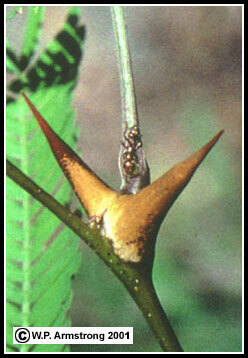 The bulbous thorns are not galls and will develop with or without their symbiotic ants partners. Additional complexities about Africa's whistling thorn (Acacia drepanolobium) are discussed in a recent article by Maureen Stanton and Truman Young in Natural History Volume 108 (November 1999). Studies by Stanton and Young reveal that four species of stinging ants live symbiotically on A. drepanolobium: Crematogaster mimosae, C. nigriceps, C. sjostedti, and Tetraponera penzigi. Their studies also reveal that the symbiotic relationship between some of these ant species and their host acacia may not be equally beneficial to both partners. Since these different species of ants are rival enemies, they occupy separate trees. If acacia branches containing rival ant colonies make contact, the different species of ants will fight each other, with the loser being evicted from its tree. 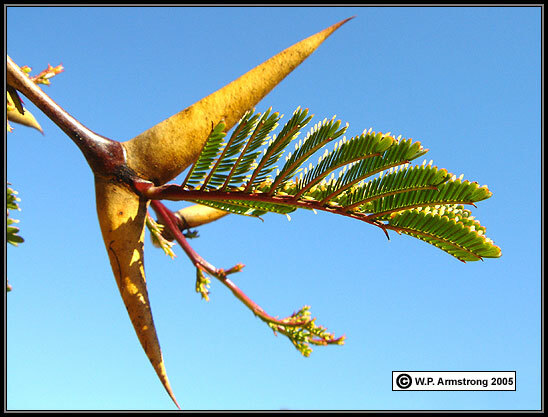 Unlike the Central American thorn acacias that provide their ant warriors with protein-lipid Beltian bodies on leaflet tips, the whistling thorn provides no such service. This forces the ants to leave the tree to forage for insects and other protein-rich foods which they bring back to the developing ant larvae living inside the swollen thorns. According to Stanton and Young, refuse pushed out of the thorn nests may help to fertilize the tree. The relationship between some of these ant species and their acacia is not completely mutualistic because it may harm the acacia tree. Crematogaster mimosae and C. sjostedti both tend scale insects that feed on the tree's vascular system, milking the aphid-like insects for their nutritive honeydew secretions. In fact, C. sjostedti pays little attention to herbivores that attempt to feed on the tree. The latter species also nests in hollow spaces within dead and dying branches, rather than in the swollen thorns. Colonies even thrive in the stumps of dead trees. To make matters worse, this species of ant often comes out the winner in battles with other ant species over the possession of a tree. According to Stanton and Young, the balance in a once mutualistic relationship has shifted in favor of one partner (the ant) at the expense of the other (the tree). Although not as extreme as Crematogaster sjostedti, the relationship between C. nigriceps and its acacia host is also one-sided in favor of the ant. This ant species chews off the tips of growing shoots, including leaf and flower buds, thus pruning and sterilizing the tree. New branches are allowed to grow mainly in the proximity of swollen thorns, thus ensuring nectar-rich petiolar nectaries (glands) on new leaves easily accessible to worker ants inside the thorns. Over time, this pruning by ants changes the growth rate and shape of the tree canopy, compared with trees occupied by other ant species. In addition, pruning is more radical on sides adjacent to rival ant trees, thus reducing the chance of contact with branches of rival trees containing more aggressive ant species. There are other trees in the Central American rain forest with symbiotic ants. Some of the most interesting are species of Cecropia of the mulberry family (Moraceae), including C. peltata and C. obtusifolia. 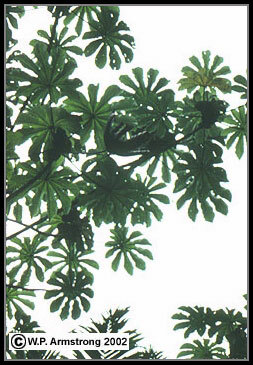 Cecropia trees are easily recognized by their large, peltate, palmately lobed leaves which are clustered at the ends of relatively few, candelabra-like branches. In Costa Rica, the reason three-toed sloths are often found in cecropia trees is that they are easier to spot in the open, leafless branches compared with other trees. The pithy limbs and stem internodes are usually hollow and occupied by colonies of Azteca ants, a neotropical genus of aggressive, biting ants. The ants commonly feed on the nutritious "honeydew" secretions of mealy bugs, but will also forage for other insect prey. 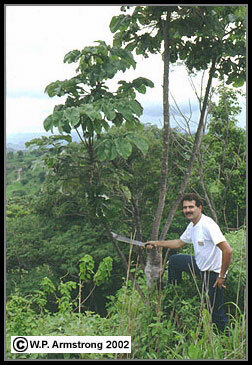 According to D. H. Janzen (Costa Rican Natural History, 1983), during the dry season in the Guanacaste Province of Costa Rica, leafless cecropia trees maintain a crop of tiny leaves bearing minute food bodies for the colonies of Azteca ants.